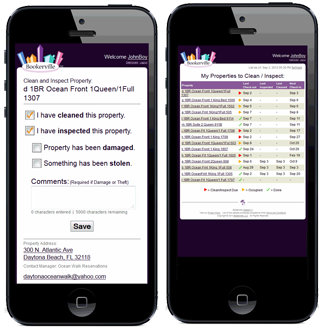 Grant cleaning and inspecting permissions to your housekeepers and inspectors, and empower their mobile devices. Cleaners - tap a simple check-box to indicate property is clean. Inspectors - tab a box to indicate property has been inspected. Damage, Theft? - They can report damage, theft, evidence of over-occupancy, or other issues. Photos - They can take photos and upload them to your account. Check-list - Easy-to-use list of properties helps them manage and report their work. And your Dashboard At-A-Glance tab has been updated with a new box to help you stay on top of cleaning and inspecting schedules, along with reports to show cleaning/inspecting history, photos, and more.